Keep your running pace under control. Improve your training by running exactly as fast as you should and beat your personal best during the race! Know and control your pace. Would you like to improve the quality of your training and run exactly as fast as you should? During a race do you think you run quite slow while in fact you start too fast and you are too tired later to finish in planned time? Would you like to run using the negative split strategy, but you find it too difficult to calculate and check split times? Have you ever dreamt of the possibility to run together with an experienced pace maker? Have you ever wanted to race agaist a friend who lives far away and it is difficult to meet him to run together? 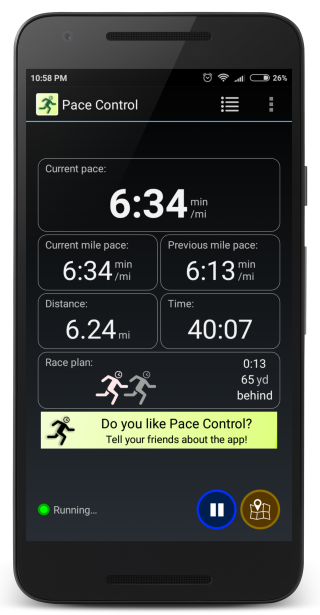 If you answered "yes" to any of these questions, you will probably be a happy Pace Control app user! Pace calculation algorithm optimized to handle the GPS signal in a way which results in stable and reliable readings. Increase your chances to achieve your goal at finish line. Race against your friend, who can be far far away, with real-time feedback. Feel the adrenaline! Improve your results by running using the negative split strategy (start slower and gradually speed up). No need to look at your phone to get information, you will hear the messages read to you in your headphones. Tracks you run with the app can be saved to GPX files, so they can be imported to external tools or sites for analysis. Possibility to export workouts to external running service: Endomondo. You can see the track of your workout on a map, so you can always quickly check where you are. All of this is available for free. No hidden costs, no paid subscriptions.